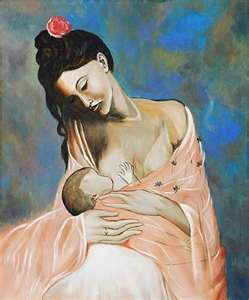 The Kerrie Show: Breastfeeding Art by Picasso! Did you know Picasso did a painting of a woman nursing her infant? I discovered this painting at my friend Jill's house [Jill, if you're reading this, please comment with your blog address so people can come see you!]. Last fall I finally got back enough brainpower (it takes me two years after having a baby to be normal again!) to realize that I could order my own print of this off the Internet and get it framed at Michael's. So now I have it hanging in our bedroom over Eva's twin bed. Whenever Sam sees it, he gets all excited and says "nay nay", which is how my last 3 kids have said nursing. The boys always said "tetita", which is a quasi-Spanish word we learned from my sister-in-law who grew up in Panama. ANYWAY, I apologize for digressing like I always do! My question is: do you own art? This is my only piece. Aron has some cool coastline paintings and a Calvin and Hobbes painting his brother did. The kids have a couple of cool ocean paintings from my mom and my friend Alex. I used to have those cheapo posters of like James Dean and Marilyn Monroe and the Eiffel Tower and Abbey Road but those are long gone. Do those count as art? FYI: I got my piece at www.art.com for only like $16 using MyPoints (25% off plus I got MyPoints)!